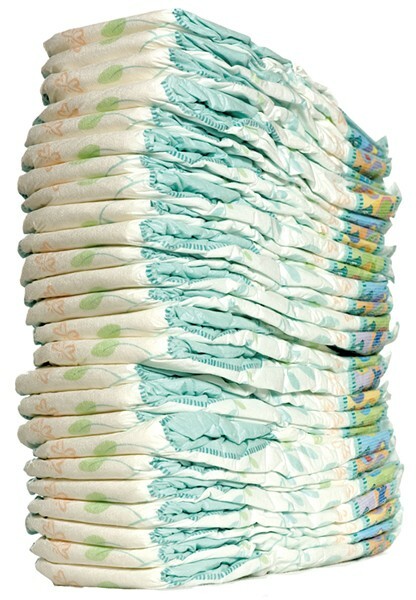 Piles of Pampers | The Kids Beat | Kids VT - small people, big ideas! Got diapers? One in three U.S. moms say they don't have enough, according to the National Diaper Bank Network, an organization that supports more than 300 community-based diaper banks across the country. The Junior League of Champlain Valley hopes to address this shortage locally by opening Vermont's first diaper bank early next year. The 55-member local women's organization, focused on improving the community through volunteerism, is currently running a diaper drive to benefit the Chittenden Emergency Food Shelf. As of mid-February, the group had donated 10,000 diapers. Prior to the drive, eight to 10 Food Shelf clients asked for diapers each day and there was very little supply, said Amanda Herzberger, the JLCV diaper bank chair. The Junior League is currently looking for a free or highly subsidized, climate-controlled storage space to house the diaper bank. It plans to distribute diapers through the Food Shelf initially, with the hope of expanding. To participate in the drive, drop off diapers, wipes and diaper cream at Healthy Living Market & Café and Lowell's Moving & Storage in South Burlington and at Kismet Place in Williston through the end of March, or buy diapers online and ship them to the Junior League through its Amazon wish list. Learn more at jlcv.camp7.org/diaper-drive.